Launching in September this year, Shadow of the Tomb Raider will be one of the first games to feature real-time raytracing, powered by Nvidia’s new Turing-powered GeForce GPUs. Nvidia’s RTX tech is also being poured into DICE/EA’s Battlefield 5 for its October launch too. Using the combination of Nvidia’s RTX and Microsoft’s DXR API. Nvidia showed off a demo at its pre-Gamescom GeForce Gaming Celebration this evening with its Turing GPU powering the real-time ray traced shadows in Lara’s latest adventure and the WWII bullet-fest that is BF5. And it all looks rather stunning in the demos shown on stage, though maybe less so in the post-show capture session pushing the new RTX 2080 Ti to its limits. The frame rates we saw show that even the top-end hardware might struggle at the highest settings. But the difference in the quality of the shadows in the, now suddenly aptly titled, Shadow of the Tomb Raider is immense. The hard edges of the traditionally rendered shadows are immediately smoothed out with the ray tracing RTX tech enabled, but that doesn’t tell the whole story. When the characters move, when the lighting changes, the shadows move with them in a fluid, utterly convincing way. With Battlefield 5, however, it’s all about the reflections. DICE has done some magic with the Nvidia RTX / Microsoft DXR combo, and has real-time ray tracing making the entire gameworld just that little bit more alive. 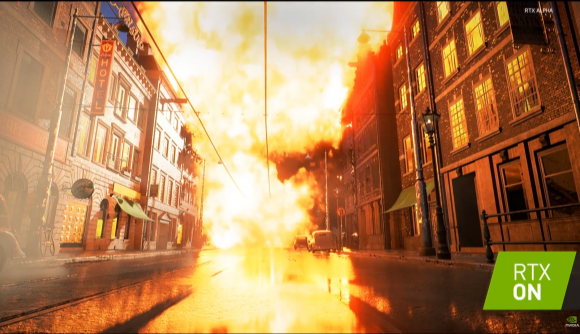 The live demo started off with the camera tight on the eyes of a soldier, and it’s the reflections in those eyes of the muzzle flash of a tank that bring to light the detail DICE is going for. Every surface, from the painted exteriors of the abandoned cars in the Rotterdam streets, to the wooden stock of rifle, to the glass panes of a broken down tram, offer accurate, ray traced reflections of the gameworld. It’s one of those stunning effects that you will almost immediately take for granted because suddenly game graphics are offering surfaces that look like they’re meant to look. It’s only when you turn the RTX settings off, and go back to the artificial, tricksy world of standard reflection rendering that you realise actually how good it looks. It’s not going to be available for the pubic beta, starting on September 5, but we should get the RTX version of Battlefield 5 very close to the game’s full release. Shadow of the Tomb Raider, however, ought to be able to offer us its properly ray traced shadows in time for the new RTX 2080 launch. Though how well it will perform with the RTX 2080 is going to be interesting to test out. But Tomb Raider and Battlefield aren’t the only RTX-compatible games coming out – Metro: Exodus, one of the first poster-children of the ray tracing platform, will have it baked in when it releases next February. Assetto Corsa Competizione will also use the tech, as will a new title called Atomic Heart. But that’s not all, there are other new titles, such as Hitman 2, and games that will get RTX updates, such as everyone’s favourite PUBG, PUBG, in the full list of 21 games Nvidia is getting RTX support from. 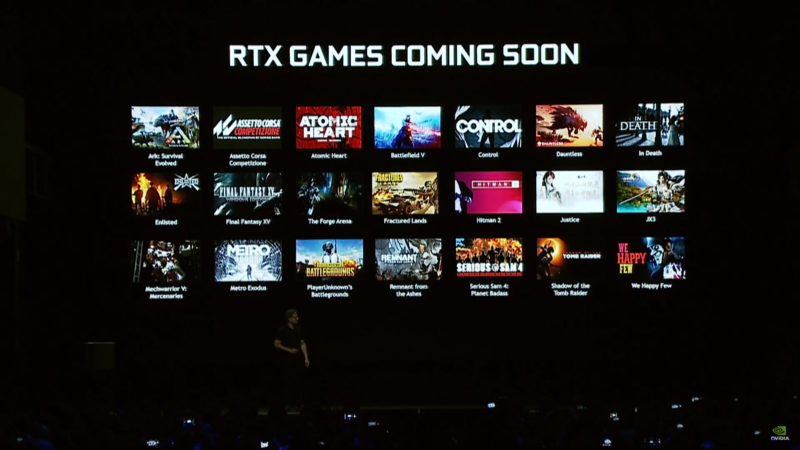 It’s only the beginning, and even the RTX 2080 Ti has its work cut out for it to manage games at the highest settings with real-time ray tracing thrown into the mix, but it’s a start and gives us a glimpse into what all the PC games of the future will look like.